The World War Two Thames Navy forts where the first forts to be set in place in the North Sea and Sealand at the time known as Fort U1 was the very first of them. Designed by Guy Maunsell the fort was put in place on the Rough Sands to guard the approaches to the Thames Estuary and the entrance to Harwich harbor, some eight miles away. Maunsell used a groundbreaking design that allowed the forts to be towed on a concrete barge from Red Lion Wharf in Gravesend by three tugs, ready to be sunk into position. February the 11th 1942 saw Navy personnel open the seacocks to begin what was meant to have been a controlled descent to the seabed some thirty foot below. 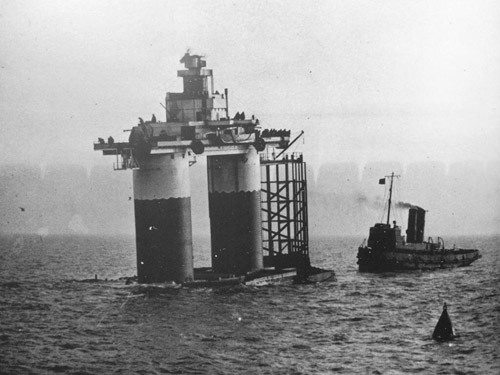 The Navy crew had been instructed by Maunsell to remove the wooden shuttering boards fixed around the barge to stop waves splashing into the hull during transit. Having removed a few of them, the crew decided to open the seacocks leaving some in place. The planned controlled descent with water flowing evenly over baffles inside the barge went awry; the boards still in place and the 4500-ton fort with a full crew on deck started to tilt and was seconds from disaster when the barge hit the ground and the structure levelled out. Lord Mountbatten watching from a nearby frigate gave orders that future forts were to be sunk in place without crew.